Peter Ganzlin and Bradi Jo Petronio at one of their moss plots. Photo by Mark Paricio. The goal of our project is to understand how terrestrial ecosystems influence permafrost temperatures. There are places in the Arctic where climate is warming but permafrost temperatures are stable, while at other places permafrost temperatures are rising rapidly with climate. Soil and vegetation that sit on top of permafrost can either promote heat transfer or act as insulators. Our project will use field measurements at research sites throughout Alaska and Siberia to identify broad trends in relationships between ecosystems and permafrost temperature dynamics. At research sites in Siberia we will make detailed measurements to identify the processes responsible for these trends. 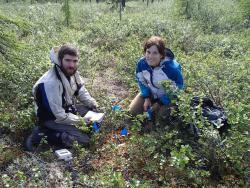 This work will help to understand the effects of Arctic vegetation change on permafrost temperatures. A tugboat pushes the barge past the old river port of Cherskiy, Russia. Photo by Mark Paricio. We will be working from the Northeast Scientific Station near the town of Cherskiy in the Siberian Arctic. 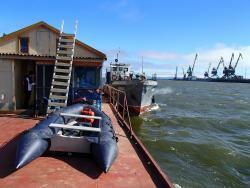 The station is located on the Kolyma River, only 60 miles from the Arctic Ocean by boat. We often work long hours because the sun doesn’t go down, but we are well fed on a steady diet of moose. At places where the river bank is eroding and thawing the permafrost we sometimes find mammoth bones! 19 July 2016 ICE CORES!! PolarConnect Event with teacher Stan Skotnicki and researcher Mike Loranty with the Vegetation Changes in Permafrost project. This event was live from Northeast Scientific Station in Russia. Newspaper article in the City & Region section of the Buffalo News highlighting Stan Skotnicki's trip to Siberia this summer as a middle school teacher through the PolarTREC program. Local Newspaper article featuring Stan Skotnicki traveling to Siberia on a scientific expedition through the PolarTREC program. Presentation at the Western Science Teachers Association of New York State (STANYS) mini conference at the Buffalo Museum of Science on March 16, 2016. The focus of the presentation will be to highlight upcoming PolarTREC expeditions, an introduction to the programs educational opportunities, lesson plans and activities for teachers at all levels. Stan Skotnicki teaches Earth Science and Physical Science at Cheektowaga Central Middle School outside of Buffalo, New York. He is in his eleventh year of teaching science and holds a B.S. in Earth Science Education and a M.S. in Educational Technology from SUNY College at Buffalo State. In the classroom, Mr. Skotnicki helps his students to see how their daily activities impact climate change locally and on a global scale. He hopes to inspire curiosity and questions in the minds of the young scientists in his classroom. When not teaching, Mr. Skotnicki enjoys spending his time with his wife discussing books or exploring the outdoors by cycling, surfing, hiking, and skiing. During the summer of 2015, Mr. Skotnicki worked as a field assistant studying how vegetation impacts the depth of permafrost in Alaska. He is excited to continue the research by becoming part of the PolarTREC team of educators. Mike Loranty is an Assistant Professor of Geography at Colgate University who studies how carbon, water, and energy are exchanged between terrestrial ecosystems and the atmosphere. Dr. Loranty’s current research projects are focused on understanding how boreal forest and arctic tundra ecosystems respond and feed back to climate warming. His work utilizes field observations, models, and satellite remote sensing. Much of his work is focused on the Siberian arctic, and this summer will be his sixth field season there. It's great that you had a great time, can't wait to hear more about this adventure later during the school year. How was the Sturgeon, that's a bizarre looking fish.